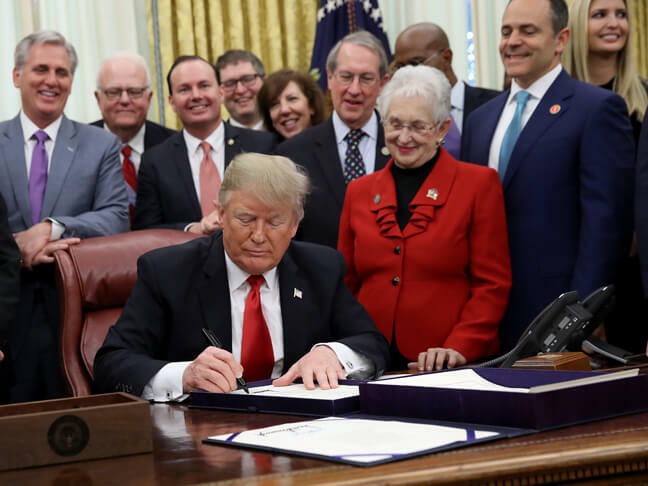 As one of the last actions taken by the federal government before the 2018–19 shutdown, President Donald Trump signed into law the Formerly Incarcerated Reenter Society Transformed Safely Transitioning Every Person (FIRST STEP) Act. In a rare instance of bipartisanship, both Democrats and Republicans in the House of Representatives and the Senate cooperated to enact major criminal justice reforms. It passed by wide margins in both houses. One can only imagine what Congress might accomplish if it spent as much time seriously engaging other important issues facing the country as it does crafting nifty acronyms. The law brings together many policy ideas that have been gaining support for years, among both liberals and conservatives. A broad consensus emerged that the federal criminal justice system was in need of reform, to correct such problems as sentencing disparities (for example, severe sentences that disproportionately impact people of color and low-income communities), prison overcrowding, and the high rate of recidivism. Reducing recidivism—that is, the problem of ex-convicts relapsing into criminal behavior and thus returning to prison—was a major rallying point in support of the law. Anti-recidivism programs help released prisoners succeed in their communities. Despite its broad reach, the FIRST STEP Act will have only a modest impact, as it involves only the federal system. According to the U.S. Bureau of Justice Statistics, almost 9 in 10 inmates in the United States are held in state prisons and jails. However, federal prisons house more than 180,000 people, more than in any one state. supporting evidence-based treatment for sufferers of opioid and heroin abuse. and much more. The FIRST STEP Act requires the attorney general of the United States (who oversees the Department of Justice) to create a “Risk and Needs Assessment System” that will encompass programs aimed at reducing recidivism. This system will include incentives or rewards for inmates’ participation in such programs and set rules around “time credits” prisoners can earn for good behavior to reduce their sentences. The law spells out the 48 categories of federal prisoners who are not eligible for sentence reductions. The law’s passage—by its very name—signals an opening for further steps toward making prisons less crowded and more focused on rehabilitation. Analysis from New York University Law School nonpartisan law and public policy institute of how the rollout of the FIRST STEP Act will impact the nation’s criminal justice system. Review of the new law by a nonprofit nonpartisan news organization (named after Justice Thurgood Marshall) that focuses on criminal justice reform. Website of advocacy organization that pushed for the First Step legislation. The full text of the FIRST STEP Act. Article explaining the new FIRST STEP act and what led to its passage.